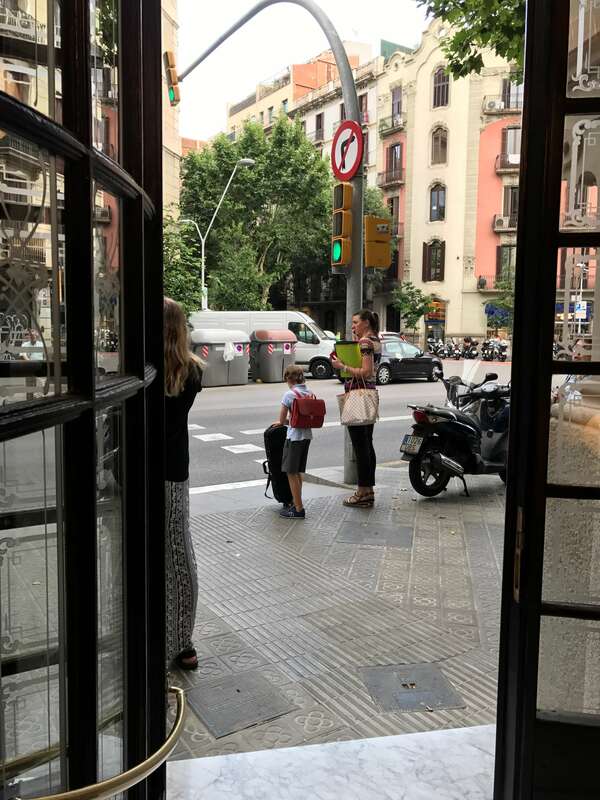 This picture was taken outside of the apartment on Balmes street. As I step foot into a new neighborhood, I feel so lost. I feel uneasy, looking around for familiar faces. I imagine myself walking outside of my apartment in Chicago and seeing my street full of parked cars. 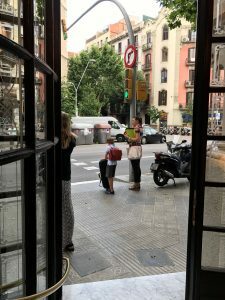 I try to envision the corner of my street, as I walk down Balmes, remembering when I would walk four minutes to the red line, to commute downtown. However, I need to adapt and learn my way around this new neighborhood. This new neighborhood that spits me into a busy one-way street, full of speeding cars, mopeds and bike riders, as I exit the front entrance. This picture was taken on my way home, as I head east. While exploring my neighborhood, I find myself having a difficult time finding street signs and figuring out intersections. In Chicago, locating intersections was a piece of cake. As I wander around, I come across this enormous sign that directs pedestrians and drivers to different locations. Back home, I would never come across a sign as big as this one with many different locations at once. 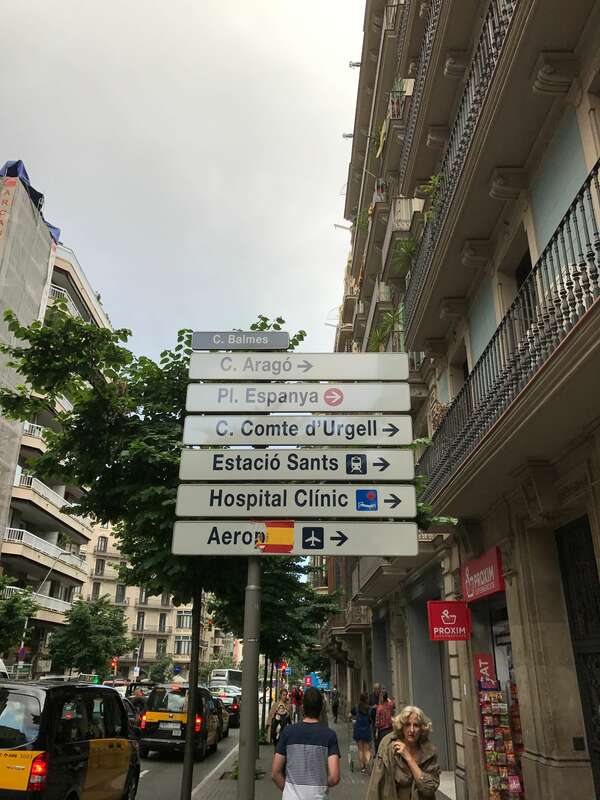 Instead, I find smaller signs directing us to a location, one or two places at a time. During my exploration, I found that water is still east, though, just like the lake, and mountains north. 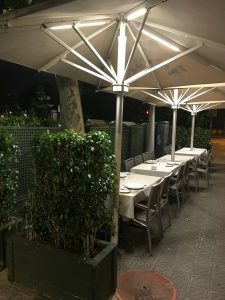 These tables currently look empty, but just around the corner I find other cafe and restaurant tables occupied with many people. In Barcelona, the mornings start late, but the nights end even later. Whenever I walk around my neighborhood in Chicago, I find businesses, such as coffee shops, closed by 8 or 9 pm. Tables and chairs are locked up and workers have clocked out for the day by 9:30 pm, the latest. The later it gets, the lonelier the streets and sidewalks get. As I familiarize myself with my new neighborhood, I try to adjust to the amount of people walking and socializing outside. I’m nearing week one, of my stay, and as I go out for a coffee run, I find myself lost on the way home. I remember some street signs, nearby coffee shops, and turn the corner to find these tables again. I feel a sense of relief knowing I’m not lost, instead I’m found. Successfully, I have found my way around the neighborhood. These tables belong to the restaurant right next to the apartment on the corner of Balmes.